The Map to Success: How Can Six Sigma Training Help with Your Process Mapping? Want to increase the efficiency of your business’s planning, development, and production processes? Learn how Six Sigma methodology and process mapping will improve the quality of your products and help you WOW your customers. Six Sigma is a proven, data-driven philosophy that benefits businesses and organizations of all sizes. Process mapping is at the heart of it. Let’s see why. Introduced in the 1980s, Six Sigma aims to increase the quality of products and services by eliminating defects from any process involved in their production. The Greek letter “Sigma” comes from statistics. Sigma measures how much a given process deviates from perfection. It is also known as the standard deviation of the process from its mean. 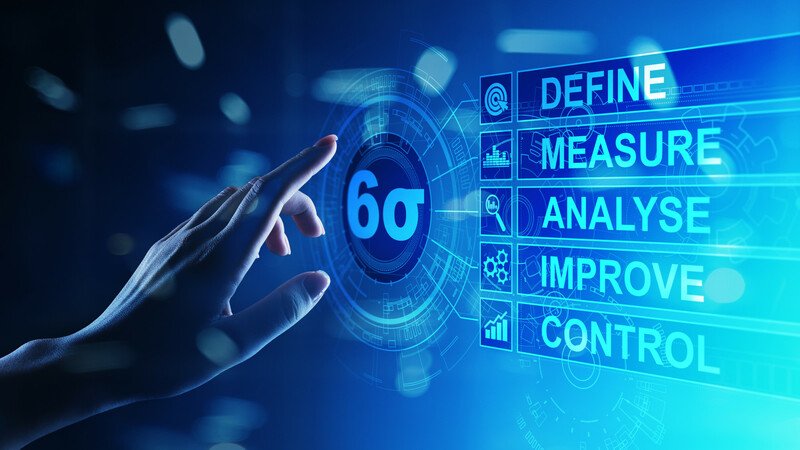 Six Sigma provides a structured approach to measuring the number of “defects” in a process and then focuses on ways to reduce variance and drive toward “zero defects” as much as possible. Businesses using Six Sigma shoot for 99.99966% of their products to be free of defects. Another way of stating the Six Sigma standard is to say that defects are reduced to 3.4 per one million opportunities. Among statisticians, that’s known as “a gnat’s eyelash”. Reducing variance and errors in processes is crucial to achieving dependability and repeatability in those processes. That improvement ultimately leads to higher quality goods and services to customers. That’s what it’s all about, right? So, now we know what Six Sigma’s goals are. But how is it implemented and where does process mapping come in? Remember, this is a structured approach to defect reduction. Structure means having a framework of actionable steps that any business can follow. First, we need to hear about DMAIC and the role that mapping and flowcharting play in it. This first step is where process mapping first comes in – read on! More process mapping using flowcharting! A cross-functional team of your employees is the best way to build a process map that defines the current steps of any process within your business. Team composition should be held to 10-15 members (or fewer for a small business) who are representative of the different departments that contribute to the process being defined and analyzed. You want the different perspectives from a diverse team as to how a process currently works and what can be improved to build a new future state process. Where does the process begin and where does it end? Now, the most valuable step – improving the process! Can any steps be combined or removed altogether? Are there delays (choke points) in the process and if so, what is causing them? How Can Six Sigma Training Help My Business? Certified Six Sigma trainers are key facilitators of effective process mapping and to implementing the Six Sigma methodology throughout all facets of your business. There are different certification levels, ranging from Green Belt to Black Belt to Master Black Belt. Get more info here. In today’s business climate, anything you can do to set your company apart from your competition is worth pursuing. Delivering consistently reliable, quality products or services to your customers is what they want…and what they expect! Looking for Help Finding a Business That…? Need help with process mapping, or anything else in the Six Sigma world? We have the resources to steer you in the right direction, saving you time and money! Click here to search.